To be in this building each week with your children is joy...pure joy. This week was special because, despite the tragic events in Pittsburgh on Saturday, we all came together as a community to learn together, support each other, and be proudly Jewish. Our 3rd graders had a blast at the ropes course. Our 1st graders learned with Omer, our shin shin from Israel. The 4th graders began the creation of their Etz Chesed (tree of kindness) while our 8th graders began to prepare their programming for the next PreK preview. Listening to the 7th graders debrief from their trip to the Center for Civil and Human Rights was powerful, especially since they are transitioning into some profound subject matter pertaining to anti-semitism. I am so proud of our students and teachers. The work they do together each week is important...from the Kindergartners to the Confirmands...they are learning, growing, building community, and solidifying their Jewish identity. This Sunday is Daylight Saving - set those clocks back before bed on Saturday night. Don't forget to like us on Facebook and follow us on Instagram. Great 4th grade pics from their classwork this week on Facebook now! 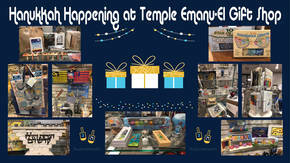 Hanukkah Happening at TE's Totally Restocked Gift Shop!! Come shop for Hanukkah! Something for every need - even gift wrap and wax-off! 10% discount for purchases over $100!